It began nineteen years ago with a tale about emotional and physical duress—byproducts of tortured lives being led by purportedly “great” men too defeated to reach their full potential until circumstances reveal the power possessed within. M. Night Shyamalan was playing with the notion of superheroes walking the thin line between reality and fantasy. He sought to show how quick humanity is to explain away the impossible as quite ordinary, reducing those leaning upon the former into victims of delusion. Through Unbreakable‘s David Dunn (Bruce Willis) and Elijah Price (Samuel L. Jackson), Shyamalan provided a grounded look at what comic books are removed from their imaginative filter. Those men become hero and villain regardless of what people think because nothing else matters if theybelieve it’s true. And while the filmmaker’s follow-up Split wasn’t sold as a sequel or beholden to the events of Unbreakable, you couldn’t help feel a kinship before the final scene’s reveal. 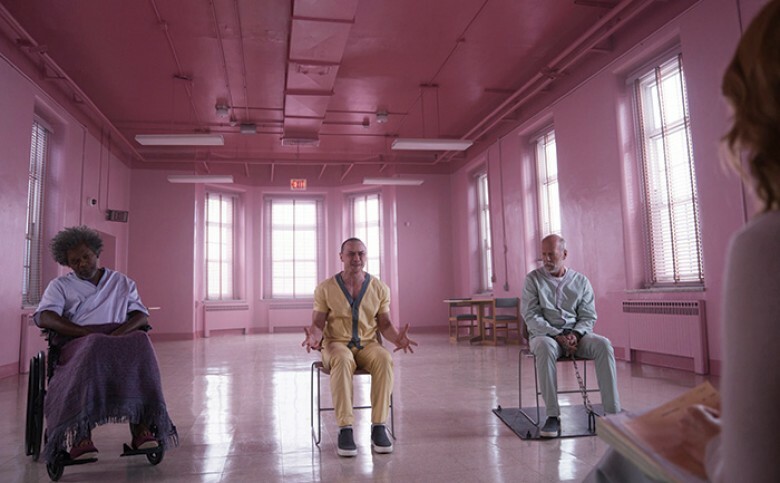 Shyamalan introduced a third form of pain via the psychological scarring of abuse and its ability to drive its prey to the fringes of society to be dismissed as liars misrepresenting “love.” Again he brought us a hero (Anya Taylor-Joy‘s Casey Cooke) and villain (James McAvoy‘s Kevin Wendell Crumb) to show the parallel journeys of empowerment and vengeance. Broken by their past and present, one retreats until finding the voice necessary to be heard while the other transforms into an unbridled muscle of rage craving the blood of those too innocent to listen and acknowledge evil’s presence amongst them. They were extremely successful as isolated stories sharing a thematic through-line to give credence to their high-concept depictions of suffering as a springboard towards enlightenment or destruction. The box office and critical consensus didn’t always agree, but I’d rather a divisive swing for the fences than by-the-numbers product for mainstream appeal any day. I personally respect the heck out of the first even if I find it flawed and truly love the second as a more polished and assured variation on its ambitions. So it should be no surprise that I entered their inevitable trilogy-capper meet-up Glass with extreme trepidation. Could Shyamalan deliver the same subtle commentary with all his cards on the table? Could his characters retain their singular potency when refashioned for a much larger story? Sadly the answer is no on both counts. Those failures don’t render the whole one, though. It’s simply a disappointing finale to a saga that held such immense promise. I think it ultimately comes down to Shyamalan biting off more than he could chew in a bid to adhere to Hollywood’s desire for trilogies despite the material demanding more time and patience. What makes this assumption worse is that we as fans and audience members supplied that patience. We stuck with the filmmaker through a couple clunkers and embraced the ingenuity of unsuspectingly bringing us back to what many believe is his career’s high water mark almost two decades later. Did he need to rush out and capitalize on that good will? No. But Hollywood feeds on buzz. It’s a shame too because there are a lot of ideas within Glass that intrigue on the same level as its characters’ respective films. Shyamalan is now using their collective awakening to posit the question of their validity as powered figures to us. Unbreakable had us watch as David and Elijah waded through the mystery of their capabilities while Split gave us a front row seat to see how far Kevin’s shattered psyche could go to manifest a physical embodiment of his personality’s darkest corners. Just because they’ve accepted themselves, though, (David’s “Overseer” as an indestructible and super strong hero, Elijah’s “Mr. Glass” a cognitively superior psychopath killing in the name of creation, and Kevin’s “Horde” an animalistic monster operating on impulse) doesn’t mean we must follow suit. 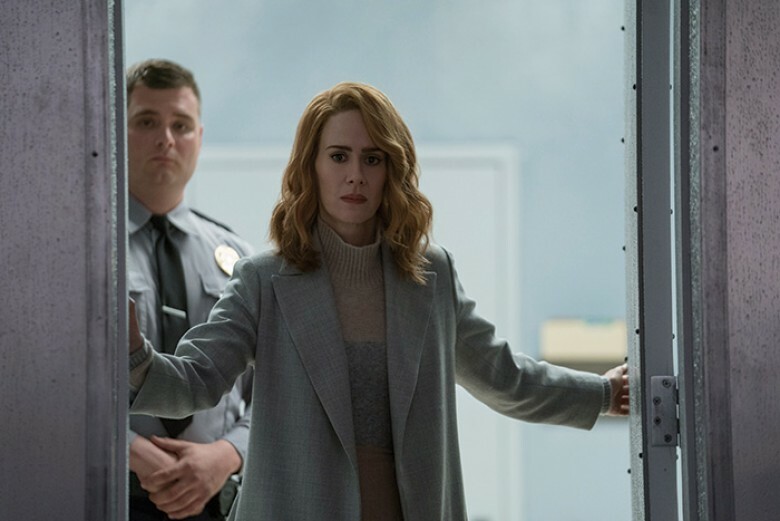 This is where Dr. Ellie Staple (Sarah Paulson) arrives with her theory reintroducing that they suffer from delusions of grandeur. She for all intents and purposes pulls the curtain of comic book fantasy to bring their world back towards our own. She utilizes their weaknesses to keep them in check within the sterile white walls of a psychiatric institution and systematically pokes holes into what we’ve seen them do. Suddenly circumstance becomes more pertinent to their powers than intent. Confidence becomes their means for leverage. It’s Staple’s ability to remove them from society and thus the fuel to feed their supremacy that lessens their certainty in themselves. If “Overseer” and “Horde” can’t overpower the other, are they truly more than man? Doubt becomes their new source of pain. While this is an astute entry point back into the universe on a macro level, however, it can’t help subverting what worked so well individually. For one it demands a rather lengthy expositional period to reiterate what we already know through this new vantage of scientific proof that we already moved past during both original films. It also forces contrived relationship dynamics. The one between David and his son Joseph (Spencer Treat Clark) was established well enough to not need a shallow subplot about Audrey’s death here. The one between Elijah and his mother (Charlayne Woodard) somehow grows stronger with her knowing his evil and Casey’s complicated mix of fear and gratitude towards Kevin is stripped to be more akin to Stockholm syndrome than the “love” Shyamalan hopes. The problem mostly stems from Elijah and Kevin being irredeemable figures whether their paths towards that end was tragic or not. We’re allowed to sympathize with them while also knowing they need to be put down, but this film wants us to see them as antiheroes. It wants us to put them on equal footing with David conceptually and literally despite clearly using them as villains previously. This desire might be crucial to Glass‘ goals, but it also diminishes their personal efficacy. So in Shyamalan’s drive to give the world he created a satisfying conclusion, he in turn does a disservice to the characters. He takes their agency away, ignoring their evolutionary arcs for another. They’re pawns in Shyamalan’s hands, the journey his rather than theirs. And that’s interesting. He’s the “comic book writer”—the creator giving the world’s outcasts a place to be weird and show how what others see as weakness is actually strength. Suddenly this series isn’t about our potential to be greater than ourselves, but those unsung heroes who allow for that belief. It’s the support systems who are truly doing God’s work to make others feel less crazy and to tell them they’re not alone. That’s a powerful sentiment in and of itself, but it unfortunately comes at the price of rendering David, Elijah, and Kevin’s existences secondary. Maybe that’s the point. Maybe that’s why Shyamalan thinks we can look past the villainy because their horrible deeds helped the “real” heroes. Collateral damage, however, cannot be ignored so easily. So while what happens is cool (the rug-pull is perhaps his most multi-faceted), it comes at the cost of being a better standalone story than worthwhile continuation as sequel. Its predecessors are great because of their own standalone properties, yet appropriating their characters for its similar goal is counter-intuitive. He’s in effect becoming “Mr. 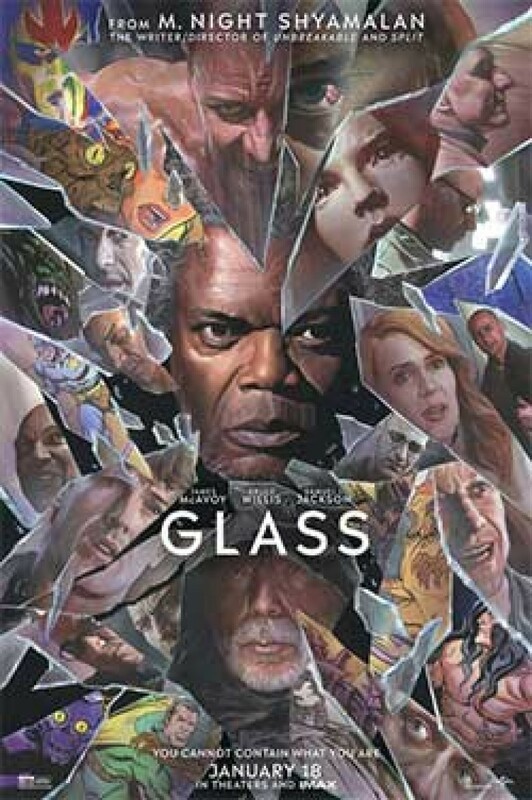 Glass” by killing the intrigue that got him here to create something new. Because we have an affinity for the past, though, the lead-up lacks the mystery Unbreakable and Split possessed. Glass therefore becomes more about the twist than the journey, something his best works escape from doing (see The Village). And it accomplishes so much so fast that it feels as if Shyamalan is running from the past rather than towards the future.